Hangboard FAQ #0: What is a Basic Hangboard Routine? I’m a strong proponent of hangboarding for increasing finger strength for rock climbing. I’ve tried many different methods, and IME, hangboarding is the most effective. For basic instructions on how to go about hangboarding, check out “The Making of a Rockprodigy”, a training plan my brother Mike & I developed many years ago. I get a lot of questions about the specifics of hangboarding, and it seems like many of the same questions come up over and over, so I will be adressing common questions in a series of Hangboard FAQs. I get some form of this question all the time, and I usually refer people to The Making of A Rockprodigy. However, that is a bit of a long read, and I assume that most people are, like me, too lazy to read through the entire thing, so here is the Cliff Notes version of a “basic” hangboard routine (note, “basic” does not mean “easy”, it means “uncomplicated”). 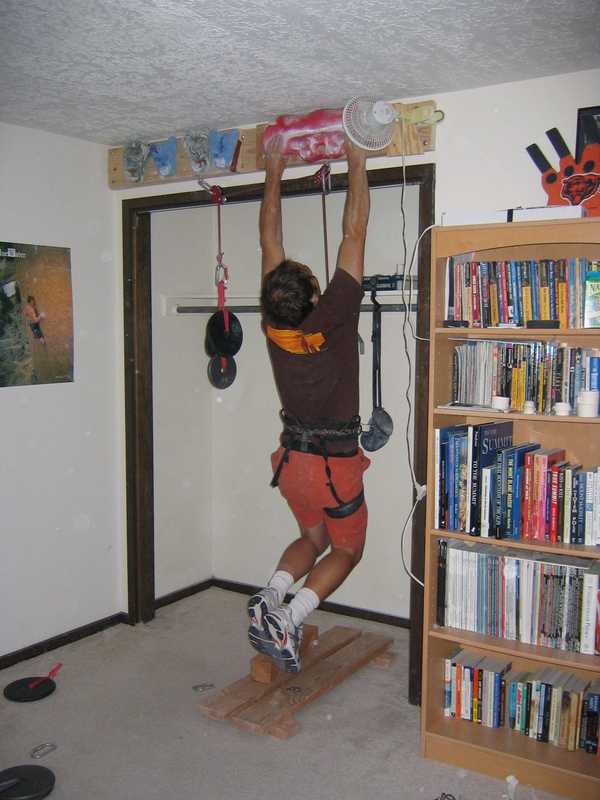 Keep in mind that a hangboard can be used a myriad of different ways, for different purposes. This is one way that has shown excellent results for increasing finger strength. If you want to know the ‘why’ behind this routine, refer to the above linked article. First of all, this routine only involves “dead hangs”, which means hanging straight-armed (with a slight bend in the elbows) throughout the entire workout. No pull-ups, no lock offs. Additionaly, this routine is designed to be used with two hands on the hangboard for every repetition (no one-arm hangs). Hangboard workouts should only be done after a THOROUGH warmup. I recommend at least 20 minutes of climbing, starting out easy and getting progressively more difficult, working through all the grip positions that will be used during the workout. The proper posture for hangboarding: Arms straight, with elbows slightly bent, head up. Note the pulley-system for removing weight. The first step in tailoring this routine to fit you is to select a set of “exercises”. These equate to grip positions, so an example of four “exercises” would be: Open Crimp, Two-Finger Pocket (Middle/Ring Fingers), Wide Pinch, Sloper. Conduct these exercises in an order that makes sense. In my experience, you will get the most bang for your buck if you limit the number of exercises to around 7 or less. Much more than that and it becomes difficult to maintain the appropriate level of intensity throughout the routine. For each exercise, complete 3 “sets” of “repetitions”. These should be done in a “pyramid” fashion, meaning the first set will involve relatively less resistance but high repetitions, and the third set will have relatively high resistance and low repetitions. The ‘Rockprodigy’ routine calls for 7 reps in set #1, 6 in set #2 and 5 in set #3. Rest 2-4 minutes between each set in the workout (I recommend 3 minutes). Complete all three sets of one exercise before moving to the next exercise. An example 3rd “set” of the Middle-Ring 2-finger pocket “Exercise” of an Advanced Hangboard Routine. Finally, the key to this routine is the “resistance”. That is, the amount of weight hanging from your fingers during each set. This varies greatly from athlete to athlete, so you will have to figure it out yourself through trial and error. A big hint: start out with much less resistance than you think you should. There are basically no consequences to using too little resistance, but potentially devastating consequences to using too much. For many people the resistance will be LESS than bodyweight, which means you will need to rig up a simple pulley system to REMOVE weight. You can get a pulley kit here, or assemble your own. Hangboard FAQ #2 addresses the “resistance” issue in a lot more detail, and explains how to rig a pulley system for removing weight. And while you’re at it, you might as well read Hangboard FAQ #1, which is mostly useless drivel. As stated above, you will want to gradually ramp up the resistance between sets (and between workouts). I generally add 10 lbs. between each set of a given exercise, and I strive to add 5 lbs. between each workout (assuming I succeed in executing the previous workout as planned). A properly-executed hangboard routine may not feel exhausting, but will thoroughly exhaust your fingers. I strongly recommend against any additional climbing or other finger training, and suggest a relatively long rest-period after completion. I rest two full days (~70 hours) after each hangboard workout. Complete 6-10 such workouts, then move on to the next phase in your periodized training cycle (ideally, maximum recruitment training). Confused? Good, you’re several years ahead of where I was when I started! 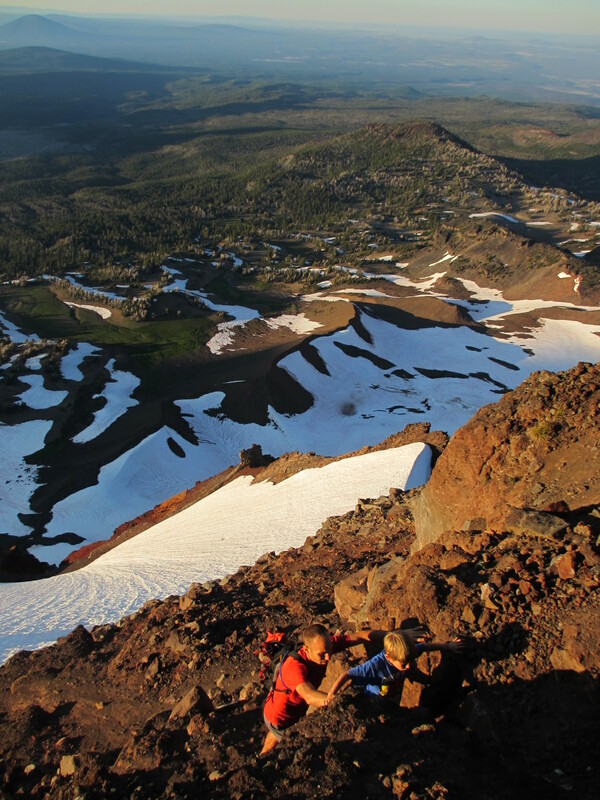 I made it back “home” to Oregon earlier this month for the wedding of two of my best friends & climbing partners, Fred Gomez and Heather Wales. “Freather”, as they like to be called, are rare examples of high school sweethearts that stuck together for the long run. 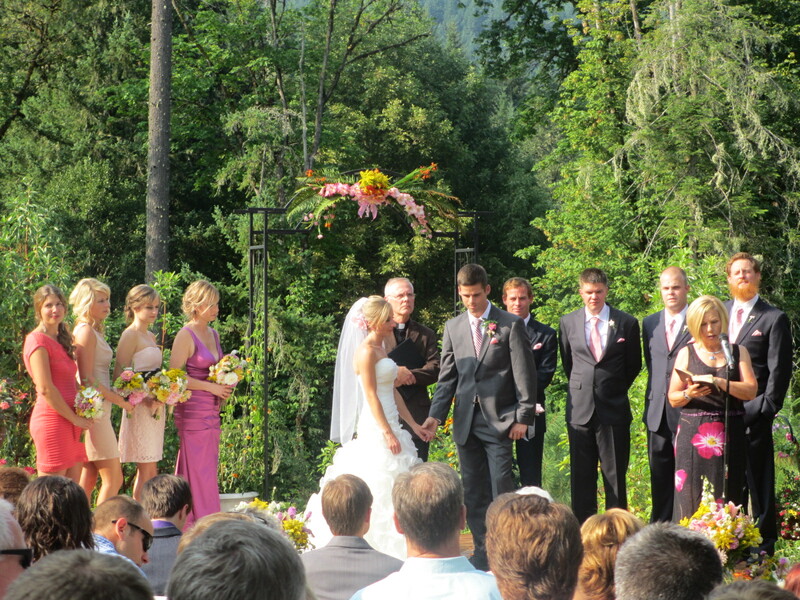 The wedding was amazing and I wish Freather the best of luck on their journey together. When 5.14 marries 5.13, expect strong children. Since most of my family still lives on the West Coast we had a brief but action-packed reunion, involving camping, boating, road biking, mountain biking, rock climbing and a short back pack trip. The temps were ridiculous (high 90’s) which made rockclimbing somewhat unpleasant, but we made it out to my spiritual climbing home of Smith Rock for an evening of easy pitches. 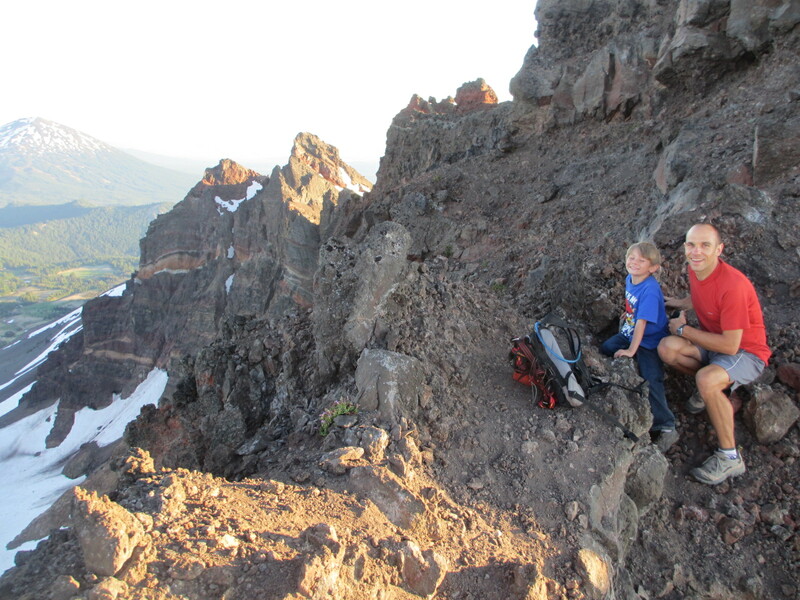 Kate & Logan below Broken Top. 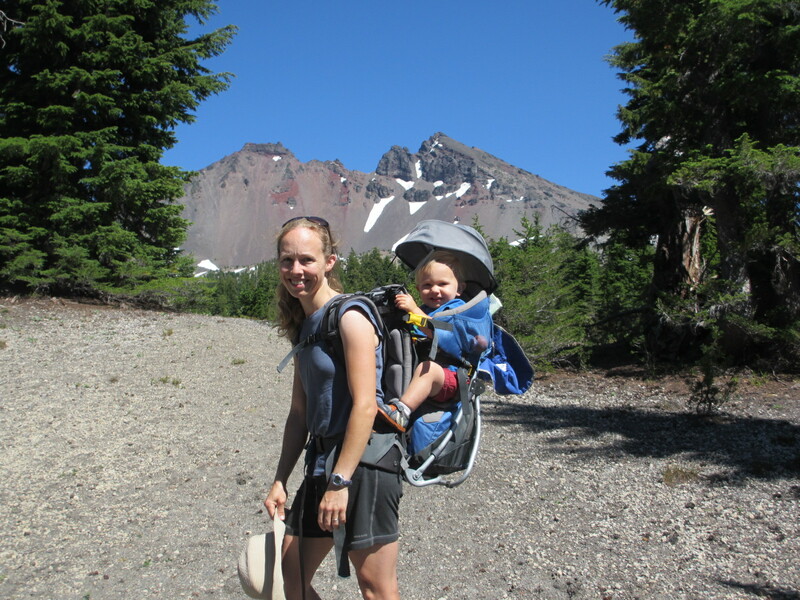 The highlight of the trip was our overnight backpack trip to Green Lake, which is perched at the foot of South Sister and Broken Top, two of Oregon’s breath-taking Cascade Volcanoes. 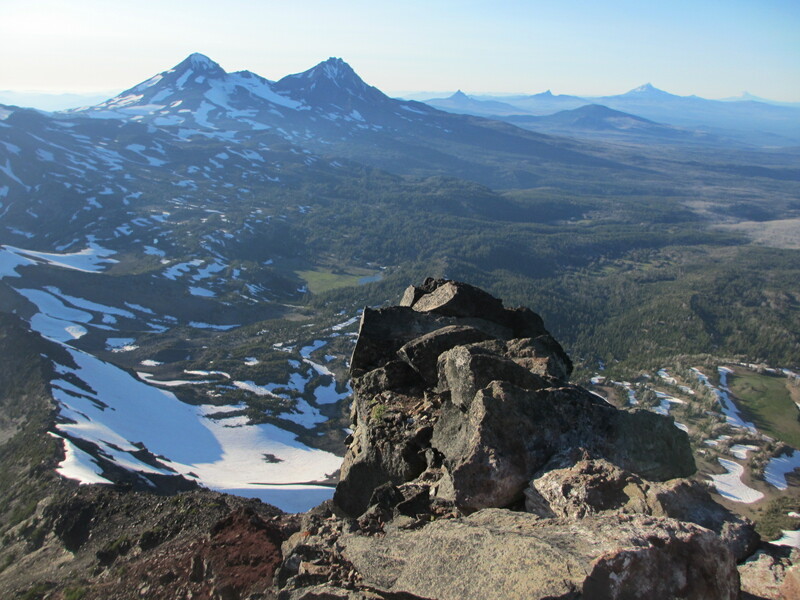 These volcanoes provided pivotal inspiration for my climbing career. I could see the Three Sisters from my childhood home in Corvallis, and as a young boy I would dream of some day climbing them. 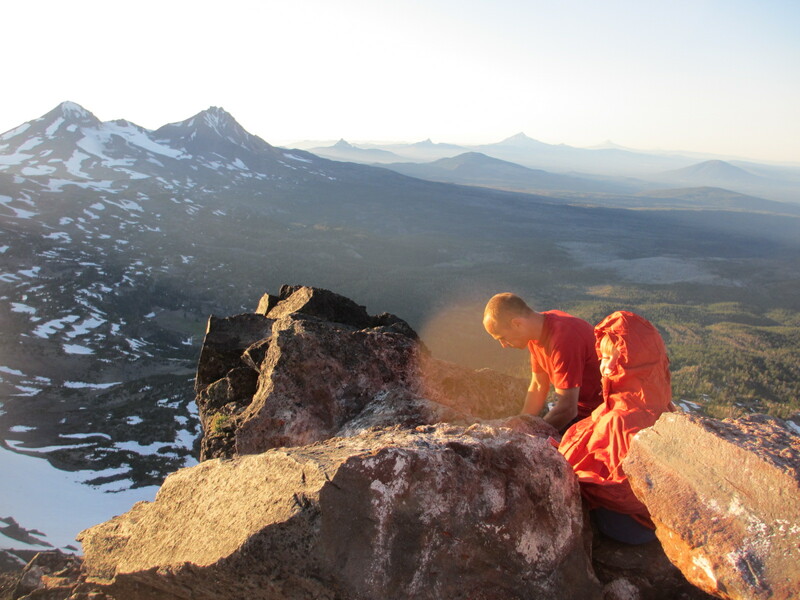 My first real summit was Middle Sister, and my first roped climb was on Mt. Washington, the next volcanic plug north of the Sisters. These beautiful peaks were the perfect training ground; just technical enough to be interesting, but not overwhelming. Of course I should mention the rock is horrendous. Absolute garbage; but the plus side is that even to this day the Canadian Rockies seem solid by comparison. Looking up towards the summit tower from the Northwest Ridge. 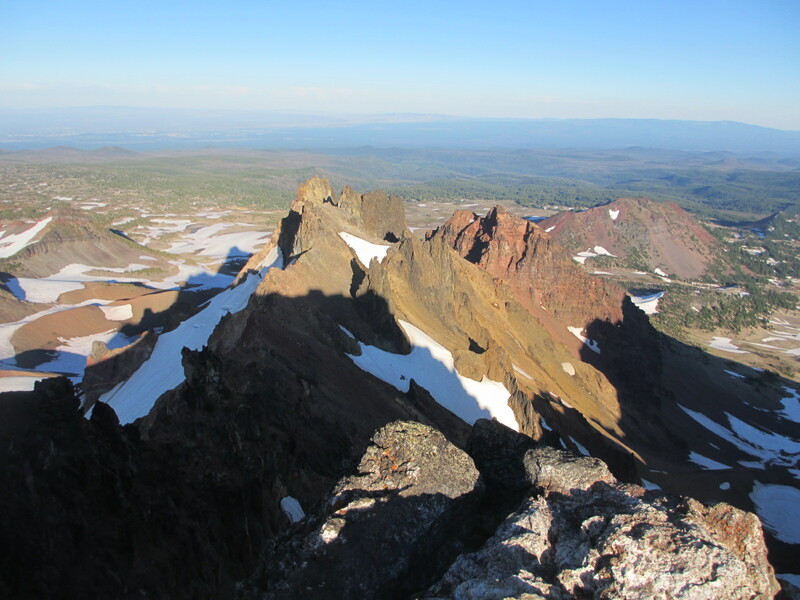 I couldn’t pass up the opportunity to dash up nearby Broken Top, which offers a few more technical challenges and 1000′ less vertical gain than South Sister. 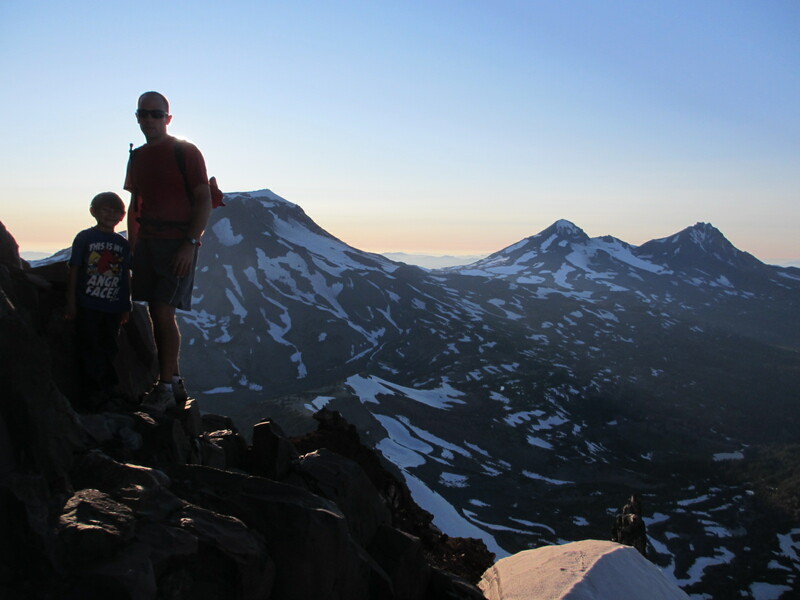 My brother Mike was along with his family, and he was keen to lead his son Lucas (just shy of 7 years old) up his first “real” mountain. I gave them a good headstart before departing from our 6500′ camp just after 6pm. Not exactly an alpine start, but I had been riding my bike a lot at altitude so I expected to make good time. 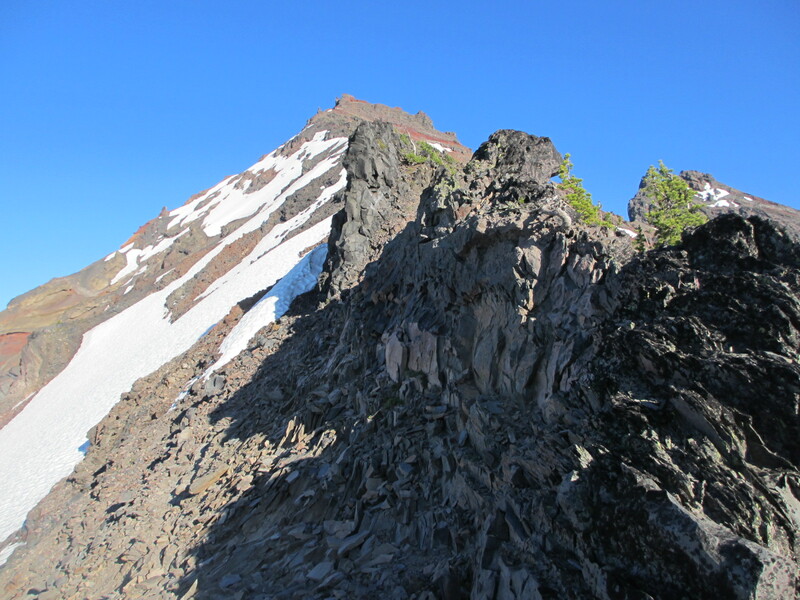 The trail goes pretty much straight up through loose scree and pumice to the Northwest Ridge, then follows the ridge to the summit. I caught up to Mike & Lucas just before the ridge, then pushed on to scout out the tricky summit pinnacle. Most of the climb is pretty trivial class 2 scramble, but the final pitch requires easy 5th class climbing on putrid “rock”. 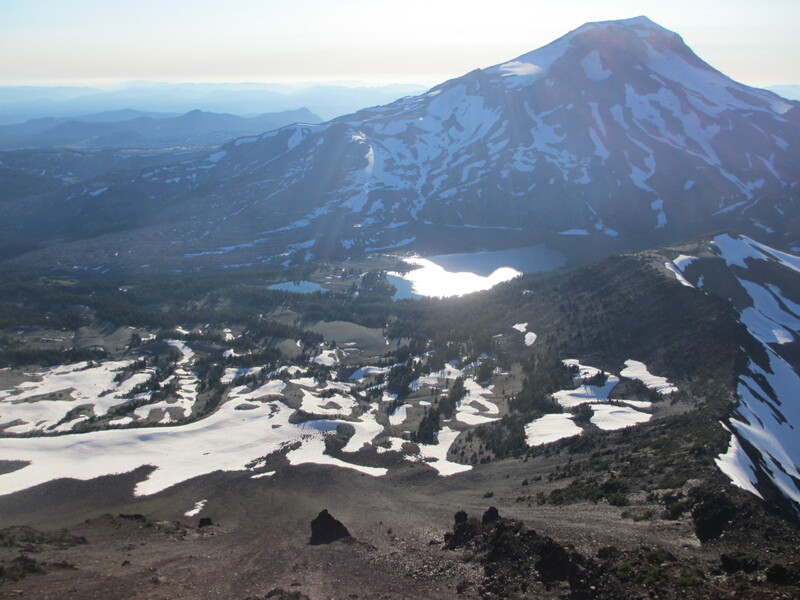 Following my nose around to the northeast corner, I reached the 9175′ summit 52 minutes after I left camp. Not too shabby for an old, fat, bald(ing) guy. I doubt I could have beat that time even in my college days. The view to the East. 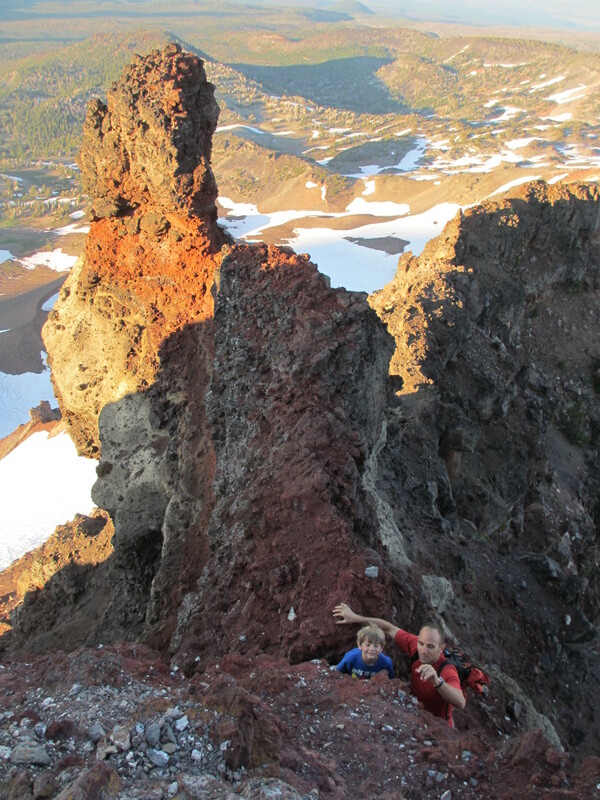 The views were outstanding, but I decided to head back down to give Mike a hand with Lucas. I met them about a third of the way up the Northwest Ridge. Lucas was making good progress despite lots of big steps and loose rock. We made good progress to the top of the ridge, then Mike & Lucas harnessed-up for the top. Lucas had no trouble with the technical climbing, but it was really nice to have two adults to spot and route-find. Mike & Lucas at the top of the ridge, with the Three Sisters behind. Literally 10 feet below the summit Lucas announced he had gone far enough, and didn’t really need to go to the top. Figuring he might regret that decision later, we were eventually able to pursuade him to continue by telling him if we sang “Happy Birthday”, he would be on top before the song was over. Scrambling up a short rock band near the top. Lucas was psyched to check out the ancient crater. The descent was a blast with Lucas bouncing from boulder to boulder like a pinball. He was pretending to be some type of video game character I’m not familiar with, holding my hand as he literally ran down the ridge. 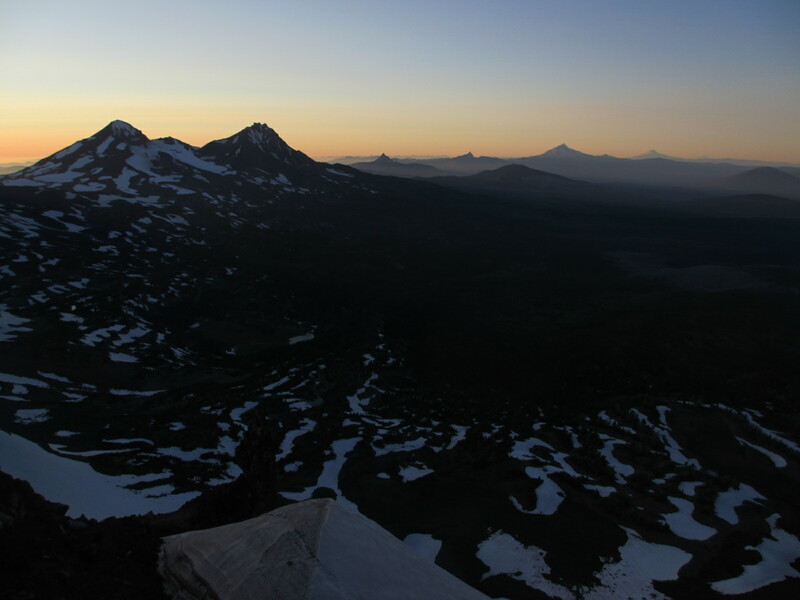 It was all I could do to remain upright, but I was psyched to get back to camp before dark and I enjoyed the challenge. It was some of the most fun I’ve ever had on descending a high peak.